Solid surface countertops remain the top choice of consumers redecorating their bathrooms, according to the October newsletter from Kitchen & Bath Design News. "Quartz, granite and solid surface are popular choices for topping off [bathroom] vanities, as consumers seek out easy-care and durable surfaces in the bath," the newsletter states. 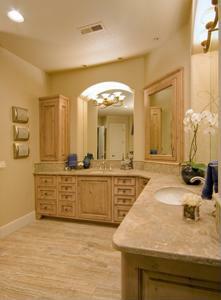 Corian is a line of synthetic solid surface countertops that is widely used in bathrooms. Many people like this material because it is easy to clean and naturally resists the growth of bacteria, mold and mildew, which makes it a perfect choice for these spaces. The company also recently released eight new colors for the surfaces - basil, arrowroot, allspice, hazelnut, hickory smoke, blue spice, cilantro and clove. Their names (and colors) were all inspired by the varied hues and textures of spice. Besides the most popular solid surface countertops of granite, quartz and synthetic materials, other options include tile, stainless steel and concrete. According to HGTV.com, "aside from appearance, one should also consider price, maintenance and compatibility when investing in a bathroom countertop."